Recently I decided to fill some holes in my baking pan collection and so I picked up my very first bundt pan. That began a search for the perfect bundt pan cake recipe to break it in. Given that it's pumpkin season I had my eye (and my pins) on some spiced pumpkin cakes. But then Anuradha from Baker Street posted a chocolatey, pumpkiny, marbleized, swirled, glazed creation that was baked in a bundt pan. My choice was made! Because I'm new to the world of bundts while Anuradha has baked everything under the sun, I decided not to mess too much with her basic recipe. The biggest change I made was to omit her chocolate glaze. I'm not much of a frosting or glaze fan in general as I find they usually make the cakes too sweet for me. So I opted for a simple dusting of powdered sugar. But I encourage you to check out the original recipe on her site and decide for yourself. The cake itself is moist and flavorful but it's also quite rich so I've only had a small slice so far. Brian, on the other hand, has been having it for both breakfast and dessert. Enjoy! In a large bowl, beat the butter, vanilla and sugar together until creamy. Beat in the eggs one at a time and then divide the batter into two bowls. In one bowl, beat in the pumpkin puree. Sift together 1 3/4 cups of the flour, 1 teaspoon of the baking powder, 1/2 teaspoon of the salt and all the spice. Add the flour mixture to the pumpkin batter and mix just until incorporated. To make the chocolate half of the batter, whisk together the remaining cup of flour, teaspoon of baking powder, 1/2 teaspoon of salt and the cocoa powder. Alternate adding the flour mixture and the buttermilk into the batter until blended. 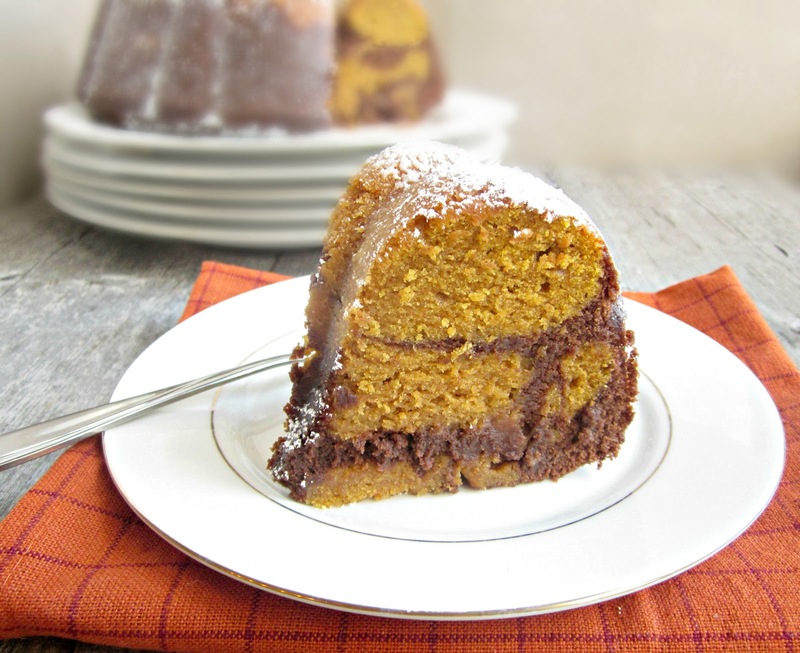 Pour half the pumpkin batter into a greased and floured 12-cup bundt cake pan. Spoon half the chocolate batter over the pumpkin layer. Spoon another quarter of the pumpkin batter over the chocolate, all the remaining chocolate over that and, finally, all the remaining pumpkin over that. Swirl a butter knife through the cake mixture several times each way. Bake in a pre-heated 350 degree oven for approximately 1 hour or until a cake tester comes out clean. Remove from the oven and allow to cool thoroughly before inverting onto a cake plate. Dust with powdered sugar or glaze. Makes approximately 12 - 16 servings. Gorgeous! And I bet just as delicious. I have a bundt pan but I haven't used it. Why???? Drool! This cake looks amazing, Anita! Yay! Your first bundt pan and also gorgeous cake! So pretty! Congrats on the first of many successful bundts! I am loving the tons of pumpkin posts though! Falling in love with Fall and these autumn recipes :D yum. Oh this looks sooooo good!! Looking forward to making this! it looks so wonderful! I'm a bundt making fool from way back because Top Girl HATES icing and so bundt is the only kind of cake I've ever been able to make her. This is one I haven't made for her. Looks like one I'll be making soon! Looks fabulous and I'm a bundt baker from way back ... from before coated baking pans ... and I'm not a frosting fan either so bundt works best for me. Thanks again! I spotted your picture at Foodporn and simply adore that slice of pumpkin choco cake. I'm also a Bundt cake fan but not into frosting.... have bookmarked the recipe. Looks so tempting and delicious! those colors look just wonderful! That cake is SOOOO pretty! 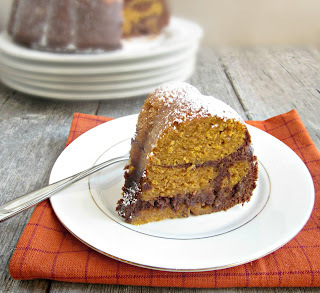 I've made a pumpkin cake before but never dared to add chocolate! I love this idea--must try soon! Mmmmmm...my kiddos would love this! Me, too! PS...I just bought some St. Germain on your recommendation. The guy at the liquor store even gave me a sample before I left....wow....it will be wonderful in my next cocktail! Omg Anita this looks delicious! I need to go to a party this weekend. I think I'm going to bring this! It screams Fall! There is nothing better than a bundt cake! I'm with you, frosting isn't my thing. If I'm going to have a treat, I like to taste the cake, not the sugar. Have fun with your new kitchen toy! I use my bundt pan to make breads too. Gorgeous! My mom just requested that I try out your pumpkin crumb cake for the holidays, will have to add this one to the list too. My house is crazy about pumpkin desserts, the chocolate marble is so pretty! Thanks for sharing this recipe with us at Foodie Friends Friday.